The early years of Henry VII’s reign were by no means carefree; his dynasty was beset by enemies in Britain and at the court of Burgundy; in the spring of 1487 a serious insurrection was launched from Ireland. In 1486 a priest called Richard Simmons traveled to Ireland with a boy called Lambert Simnel. This boy was the same age and had the same features as Edward, Earl of Warwick, son of George Duke of Clarence and nephew of the two Yorkist Kings. The real Edward was safely imprisoned in the tower by Henry but it was possible through clever propaganda to pursue the claim that the boy imprisoned by Henry was the imposter and that Simnel was the real Earl of Warwick, next in Yorkist line to the throne. It was this claim that would form the basis for an invasion by the Yorkists in 1487. The banner for this claim was carried by Margaret, Dowager Duchess of Burgundy who was sister of both Edward IV and Richard III. She was supported in her campaign by a number of nobles in England including John De la Pole, Earl of Lincoln, who was himself the son of Elizabeth, another of the sisters of the two Yorkist Kings. However his claim was considered too tenuous and an attempt to raise a rebellion in north and west England in 1486 came to nothing. Not to be defeated by this setback, Margaret developed the plan to use Lambert Simnel as a claimant to the throne. Margaret of Burgundy provided between 1500 and 2000 German mercenaries (including Swiss and Flemish) under a captain named as Martin Swartz. Exact details of these mercenaries is scarce but it is assumed that they were mostly footmen (Bill and pike men, crossbowmen etc) and that they included at least some men armed with the relatively new arquibusier. The rebel army was put together in Ireland, where opposition to Henry Tudor was strong. Simnel was crowned King Edward VI of England in Dublin on 24 May 1487, and on 4 Jun Simnel, accompanied by Lincoln and Francis, Lord Lovell, landed near Furness in Lancashire and advanced through Yorkshire. As they marched the rebels gathered reinforcements. The invading army now consisted of the German mercenaries, and some 4000 Irish levies as well as some English knights and their retinues. In total the force was perhaps 7,000 to 8,000 strong. It was hoped that more recruits could be gained as the army marched through Yorkshire but York held out for the King and the rebels had to continue south with little extra support. At the Yorkist side we could find: John, Lord Scrope of Bolton; Thomas Lord Scrope of Masham (imprisoned and fined); Alexander Appleby (attainted Nov 1487); George Ascough; Sir Ralph Ashton; John Avintry (attainted Nov 1487); Richard Bank (attainted Nov 1487); Thomas Batell (attainted Nov 1487); John Beaumont (attainted Nov 1487); Thomas Blandrehasset (attainted Nov 1487); Sir Henry Bodrugan (attainted Nov 1487); John Broughton (attainted Nov 1487); Sir Thomas Broughton (killed in battle; attainted Nov 1487); William Claxton (fined); Phillip Constable of Flamborough (fined); Thomas David; Thomas Fitzgerald (killed in battle); Edward Frank (imprisoned and fined; attainted Nov 1487); Thomas Geraldine (killed in battle); William Hammond; Roger Harlington; James Harrington (attainted Nov 1487); Thomas Harrington (attainted Nov 1487); Richard Harleston (escaped to Burgundy; attainted Nov 1487); Sir Edmund Hastings (pardoned); Robert Hilton (attainted Nov 1487); Richard Hodgeson (attainted Nov 1487); Edmund Juse (attainted Nov 1487); William Kay (attainted Nov 1487); Giles Mallary of Grevysnorton (attainted Nov 1487); John Mallary of Lichborough (attainted Nov 1487); Robert Mallary of Fallesley (attainted Nov 1487); William Mallary (attainted Nov 1487); Robert Manning (attainted Nov 1487); Thomas Metcalffe (fined); Richard Middleton (attainted Nov 1487); Nicholas Musgrave of Brackenthwaite; Robert Percy of Knaresborough (attainted Nov 1487); Sir Robert Percy of Scotton; Sir Thomas Pilkington; John Pullen (pardoned); Rowland Robinson (imprisoned and fined; attainted Nov 1487) and Clement Skelton (attainted Nov 1487). From Doncaster a royalist force of some 6,000 men under Sir Edward Woodville tried to challenge the rebels but were outnumbered and chose to retreat ahead of them instead. This retreat continued for 3 days as the rebels advanced down through Sherwood past Ollerton and it is claimed that Nottingham was evacuated as the threat from the rebels drew nearer. Somewhere close to Farnsfield the rebels turned off the Nottingham road and headed towards Newark. This would make sense as it would bring the rebels into reach of the Earl of Lincoln’s lands where they might have some security. Henry was at Kenilworth, but calling up nearby levies, he set off at once for Nottingham. By the time he arrived there, 14 Jun, the rebels were at Southwell, some twelve miles to the north-east. According to the contemporary account of a herald, Henry moved to Radcliffe, between Nottingham and Bingham, on 15 Jun, while the rebel army crossed the Trent by the ford below Fiskerton and took up a position on an open escarpment some 1,500 yards south of East Stoke. Here the King met them on the morning of the 16th as he was marching towards Newark. The rebels held the advantage in numbers, perhaps 9,000 to Henry’s 6,000, but apart from the German mercenaries their soldiers were not well armed or trained. As was normal for the time the army was split into three parts of fairly equal size. The first of these, the Van, was under the command of the Earl of Oxford and it was this force, numbering some 8,000 that formed up first in front of the rebel army, and would have included all the major elements of a late medieval army including heavy cavalry, large numbers of bowmen, pike and billmen and assorted general infantry armed with light weapons and a variety of armour. They would have been fairly well trained although not to the standard of the German mercenaries. Their big advantages were their better armour and their large number of longbowmen. A plan of the battle according to R Brooke (1825). This orientation is now considered to be incorrect. Lincoln and the rebels had camped overnight on the high ground south and west of the village of East Stoke. It is here that they are assumed to have drawn up their forces in the morning facing south east towards the Fosse Way below. 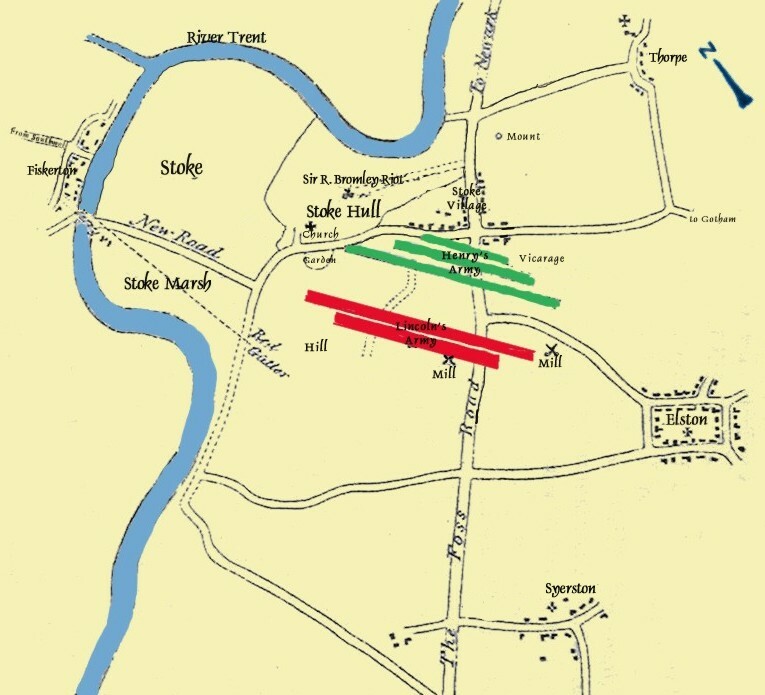 The opposing forces were drawn up facing each other by 9am and rather than wait for the rest of the royal army, Oxford began a withering bow fire upon the rebels on the higher ground in front of him. Whilst unlikely to cause to much harm to the armoured English and German contingents, this had a serious effect on the unarmoured Irish mercenaries and Lincoln was faced with a choice between standing his ground and having half his army destroyed by bow fire or attacking down the hill. Whilst this would mean he would lose the advantage of the high ground it would at least give him a chance to deliver a single crushing blow to Oxford’s forces. The fight lasted for more than three hours and was fiercely contested, the rebel army being well buttressed by the German contingent. Lincoln’s attack did indeed meet with some initial success but again in close combat the poor equipment and armour of half of his force quickly showed and a counter attack by Oxford was enough to break the resistance of much of the rebel army. Their commander Martin Schwartz and Lincoln were (killed in battle); Lovell escaped by swimming the Trent and was never seen alive again, and Simnel was captured and put to work in the royal kitchens. The rebel soldiery were slaughtered by the thousand in a gully at the foot of the ridge and in the marshy riverain fields. They had, however, inflicted very heavy casualties on Henry’s army, possibly as many as 2,000 men, most of whom were from the vanguard. In total is thought that some 4,000 to 5,000 of the rebels were killed during or after the battle. Any surviving Irish and English that had been captured were hanged. However a number of the men of note in the rebel army were spared with fines and attainders against their property. The German mercenaries who survived were allowed to go free but without their pay. Most of those who died on the field were buried in mass graves on site on the same day as the battle. In the height of summer this would have been a priority. By his victory at Stoke, Henry secured the safety of the Tudor dynasty. 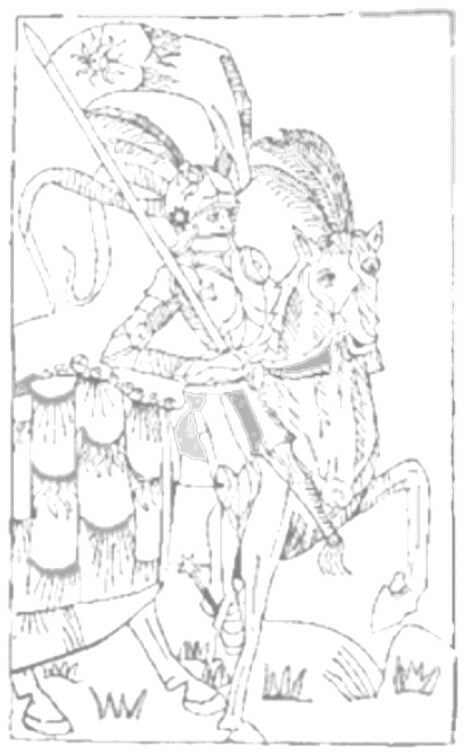 On his side, we could find: Jasper Tudor, Duke of Bedford; Thomas Stanley, Earl of Derby; George Talbot, Earl of Shrewsbury; Edward Courtenay, Earl of Devon; Sir Henry Percy, Earl of Northumberland; Edward Stafford, Earl of Wiltshire; Edward Grey, Viscount Lisle; Henry Lord Clifford; George Grey of Ruthin; John Lord Grey of Powys; Edward, Lord Hastings; George Stanley, Lord Strange; Sir Edward Woodville, Lord Scales; Sir John Arundel (knighted after battle), Sir John Babington (knighted after battle); William Bedyll; Edward Belknap; Sir Roger Bellingham (knighted after battle);Sir Edmund Beningfield (create knight banneret after battle); Sir Maurice Berkeley (knighted after battle); Sir James Blount (created knight banneret after battle); Sir Thomas Blount (knighted after battle); Sir Henry Bold (knighted after battle); Sir Robert Brandon (knighted after battle); Sir Thomas Brandon; Sir Robert Broughton (knighted after battle); Sir Anthony Browne (knighted after battle); Robert Brudenell; William Bulmer; Sir Edward Borough (knighted after battle); Sir Maurice Borough (knighted after battle); Sir William Carew (knighted after battle); Sir John Cheney (created knight banneret after battle); Sir Robert Cheney (knighted after battle); Sir Robert Clifford (knighted after battle); Sir Gervase Clifton; Sir Thomas Cokesey (knighted after battle); Robert Cotton; Sir Richard Croft (created knight banneret after battle); Robert Daniel; Sir Edward Darell (knighted after battle); Sir Richard Delebare (knighted after battle); Sir John Devenish (knighted after battle); Sir John Digby (knighted after battle); Sir Simon Digby; Edward Fielding; Thomas Findern; Sir Richard Fitzlewis (knighted after battle); Godfrey Foljambe; Sir John Fortescue (knighted after battle); Thomas Green; Thomas Gresley; Sir Thomas Grey (knighted after battle); Nicholas Griffin; Sir Thomas Hansard (knighted after battle); Sir James Harrington (knighted after battle); Sir George Hopton (knighted after battle); William Hugton; John Hussey; William Knyvett; John Langford; Richard Latimer; Sir William Littleton (knighted after battle); Sir John Longville (knighted after battle); Sir Ralph Longford (knighted after battle); Sir George Lovell (knighted after battle); Sir Thomas Lovell (knighted after battle); Edmund Lucy; Sir Thomas Lynde (knighted after battle); John Markham; Henry Marney; William Merbury; William Mering; Thomas Monington; John Montgomery; John Mordaunt; Sir John Mortimer (knighted after battle); Sir John Musgrave (knighted after battle); Sir George Neville (knighted after battle); John Neville of Thornbridge; Ralph Neville; William Newport; Sir Edward Norris (knighted after battle); Sir William Norris (knighted after battle); George Ogle; Roger Ormston; Sir James Parker (knighted after battle); Sir John Paston (knighted after battle); Sir Amyas Paulet (knighted after battle); Robert Paynton; David Phillip; Sir Edward Pickering (knighted after battle); William Pierrepont; Sir Richard Pole (knighted after battle); Sir Thomas Poole (knighted after battle); Thomas Pulteney; Sir Robert Radcliffe (knighted after battle); Sir William Radmill (knighted after battle); John Rainsford; John St. John; Richard Sacheverell; Sir William Sandes (knighted after battle); Sir John Sapcote (knighted after battle); Sir Humphrey Savage (knighted after battle); Sir John Savage; Robert Sheffield; Sir Ralph Shirley (knighted after battle); Charles Somerset; Edward Stanhope; Humphrey Stanley; Sir Humphrey Stanley (created knight banneret after battle); Sir Brian Stapleton; Sir William Stonor (created knight banneret after battle); Edward Sutton; Sir Gilbert Talbot (created knight banneret after battle); Thomas Tempest; Rhys ap Thomas; Robert Throckmorton; Sir William Tyrwhitt (knighted after battle); Sir William Trouthbeck (knighted after battle); Sir Thomas Tyrell (knighted after battle); Sir William Vampage (knighted after battle); Sir Nicholas Vaux (knighted after battle); Henry Vernon; John Villiers; Thomas Walton; John William; Sir Henry Willoughby (knighted after battle); Sir John Windham (knighted after battle); Guy Wolston; Sir Thomas Wolton (knighted after battle); and Sir Christopher Wroughton (knighted after battle).